The effective computer interpretation of engineering drawing remains a desirable aim yet it continues to provide academic challenge. Much early work was concerned with the interpretation of low level vectorised data. For simple drawings, direct association and interpretation of the low level data often provides a very effective technique but drawing data, whether linework or higher level textual information, can be subject to inaccuracies and uncertainties of interpretation. Thus drawing errors and problems introduced by scanning are likely to introduce ambiguities which cannot be resolved directly from the low level data. 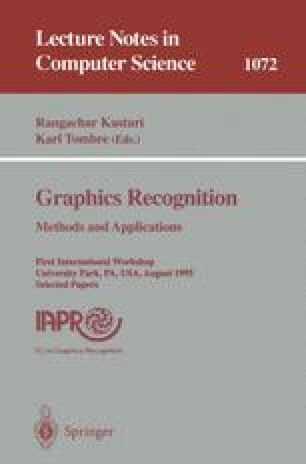 The approach described in this paper combines features of a low level approach based on node and vertex association with a higher level interpretation of the textual content of the drawing. The textual description of dimensions, etc. has previously been used by the authors and by others, for the correction of drawing structures, in some cases using 3-D reconstruction as a means of validating the data association. The present work attempts to model an aspect of human drawing interpretation, whereby an ‘envelope of expectation’ is developed, through the interpretation of dimensioning and annotation information. This approach allows a link to be established between the highest level information on the drawing (such as the title block) and the low level vectors of the three elevations. It is thus no longer necessary to interpret obscure detail within the vector data directly. Separation of text on the drawing using OCR techniques allows the field of interpretation for the linework to be significantly narrowed.